ChrisWeigant.com » Electoral Math Checkup -- Obama's Low Point? Electoral Math Checkup -- Obama's Low Point? Barack Obama has had a hard few weeks in the polls. In fact, this week's check of how the electoral math plays out may (hopefully) be his lowest point during the campaign. I say this not out of unbridled optimism, but because of a basic fact -- what we examine here are state polls, not national polls; and the state polls always trail the national trends by a few days to a week. And the national trend for Obama may have turned around in his favor in just the last couple of days. So even though things look grim here, Obama is already starting to bounce back. The last time we looked at these graphs was just before the convention. Since that point, Obama got a bounce from the Democrats' convention, and McCain got an even bigger bounce from the Republican convention (and from naming Sarah Palin as his running mate). But, as with all convention bounces, what goes up usually comes right back down. Leaving us (on the national level) pretty close to where we were before we started. But on the state level, the McCain/Palin bounce still shows up very strongly. But it may have peaked. Examining state polls is always tough, because until every state is polled every day there just isn't enough up-to-the-minute information to accurately portray where all the states are at. Ten states haven't been polled in a month, for instance (listed at the very end of this article, in the "data" section). But overall, state polling has gotten more intense, with more polls out there and with polls in battleground states coming every few days. So the information flow has improved a bit over the numbers we were seeing this summer. No poll is perfect, but more information coming in is always better. Obama (blue) starts from the bottom, and McCain (red) starts from the top. Ties are white, in the middle. Scale is percent of total Electoral College vote (538). Since our last snapshot, Obama's numbers rose to the middle 50s, and then fell back in a big way. This reflects the "convention bounce" for both parties. But Obama is currently at just under 46%, the lowest he has been in the entire campaign to date. Even more alarming, McCain's numbers touched the magic winning number just a few days ago, but have since fallen back due to Virginia and Pennsylvania currently being tied. Put Pennsylvania back in Obama's column, as I fully expect, and the numbers get a lot better. But still, this is the first time John McCain has hit the winning 270 votes in the entire campaign, so let's hope the trends reverse soon. 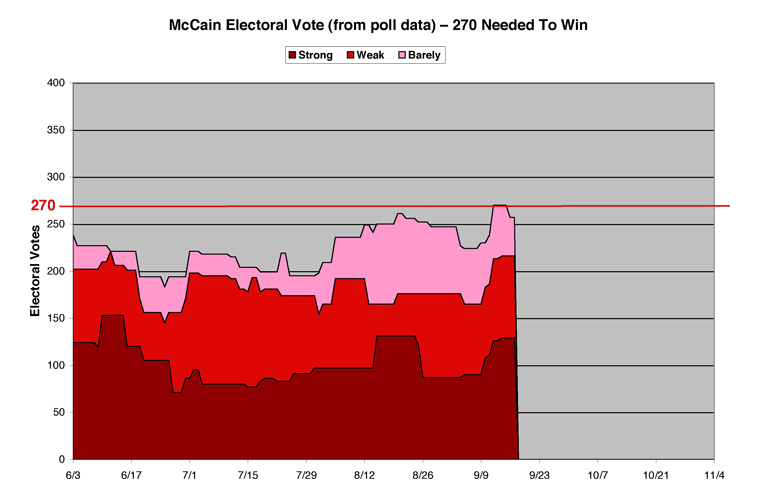 Since our last snapshot, McCain lost some of his base support, and then saw it roar back after he picked Palin. His Strong states (10% or better lead in the polls) came back, and he expanded his Weak (5% or better) states as well. However, this meant some of his Barely states moved into stronger columns, reducing their number. But as you can plainly see in this graph, he did touch the magic 270 number last week. Only recently has this come down, but it remains to be seen whether this will be the peak of his convention bounce, or whether he can continue winning over the swing states. In the crucial "Strong plus Weak" measurement I watch, McCain has added 40 votes from last time. From a previous total of 176 he has now risen to 216 -- the strongest position he's been in since June. Taking a look at Obama's chart is just as dismal as you'd expect after seeing those other two. But it's not altogether bad news. In the Strong category, Obama has actually only lost one vote from before the convention. He got a convention bounce, went up a bit, and then came back down. But he's nowhere near the numbers he had in July, obviously. More bad news is what is happening in the other two categories. Obama's Weak support has dramatically dropped, some moving to his Barely column, but mostly moving towards McCain. Before the conventions, Obama had 116 Weak electoral votes, now he has 67. This dramatic slide is the most alarming thing to see this week, and this needs to be turned around if Obama is going to win this thing. As I mentioned, Obama's Barely support grew a bit from this migration, but not enough to stop the slide altogether. 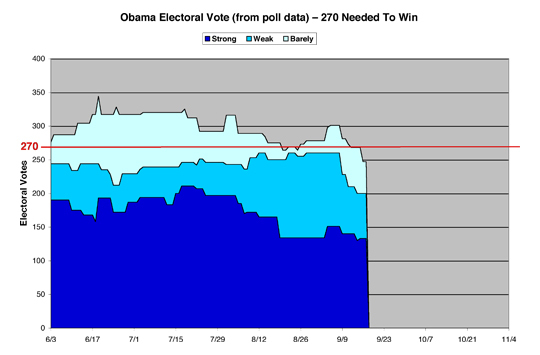 For now, Obama's "Strong plus Weak" number stands at 200 -- down a whopping 50 electoral votes. As I said, pretty dismal. And, for the first time, McCain's Strong plus Weak number is above Obama's. For another view, as a check on my own charts, we turn once again to Sam Minter of abulsme.com, and his chart. His averages the last five polls, whereas mine just takes the data from electoral-vote.com, so his data is generally less volatile than mine. As always, Minter's maps and charts are available on a daily basis on my webpage as well. His chart combines my three charts above into one. Obama starts from the top, McCain starts from the bottom, and wherever the double pink/baby blue line is determines who is ahead. There has been some talk starting to percolate that perhaps McCain's bounce has peaked at this point, and we'll start seeing an Obama recovery. There are perhaps some hints at that in the national polling. But with the exception of New Mexico returning to "Weak Obama" status after a brief flirtation with being a swing state and Delaware strengthening with the Biden choice, Obama has had no other moves in his direction in my state level classifications since August 25th. A full three weeks ago at this point. If there is an end to the McCain bounce and a move back toward Obama again, it has not yet started to show itself in the state level polls. It is also worth noting however, with all the hand wringing from the Democratic side on how bad the situation has been in the polls for Obama post-convention, that the current state of things is NOT a clear McCain victory by any means. What we have in the state by state polls is as close to a tied race as possible. Of course, that is NOW. We've got a month and a half or so more to go, with several debates, and new significant news events each day for the candidates to react to. The situation can change drastically in either direction practically overnight if one or another of the candidates does something particularly good, or particularly bad. Things are very unsettled and dynamic right now, and are quite likely to stay that way straight through to election day. Right now using my methodology, the swing states are: Pennsylvania (21 electoral votes), Ohio (20 ev), Michigan (17 ev), Virginia (13 ev), Indiana (11 ev), Colorado (9 ev), Nevada (5 ev), New Hampshire (4 ev), Montana (3 ev), North Dakota (3 ev). If you live in one of those states. Pay close attention to this race. Your vote will matter. And finally, my own take on the situation. I start with the polls, and then add in my own gut feelings about how states will actually vote, together with some "throw the dart at the wall" sheer guesswork. In other words, take all of the following with a large grain of salt. Obama loses one state from the Safe category, as Washington seems to be softening up for him. And (no surprise) Delaware can now be counted as a lock for Obama, due to Joe Biden being on the ticket. While Delaware has but three electoral votes, it is at least some movement toward Obama instead of away. The full list of Safe states for Obama stands at 16, with a total of 196 electoral votes -- CA, CT, DC, DE, HI, IA, IL, MA, MD, ME, NJ, NY, OR, RI, VT, WI. Obama's Probable states showed a lot of activity this time. Washington state moved down to this category from Safe, and Delaware moved up (to Safe), but two states had to be downgraded from Probable to Lean this week -- New Mexico and Pennsylvania. Now, I fully expect Obama to improve in both states and take them on Election Day, but for the time being they are reflecting McCain's bounce and so they had to be reclassified for now. This leaves Obama with four Probable states -- MI, MN, NH, WA -- for a total of 42 electoral votes. Total for Likely Obama: 20 states, 238 electoral votes. This is down from 264 electoral votes last time, and is a cause for worry. But not panic, at least not yet. McCain now has 16 states in the Safe category, but he only added one here. Again, no surprise, Alaska is now comfortably in McCain's column after the choice of Sarah Palin as his running mate. This gives McCain a total of 134 Safe electoral votes at this point. McCain's Safe states -- AK, AL, AR, AZ, ID, KS, KY, LA, MS, NE, OK, SC, TN, TX, UT, WY. McCain's Probable lost Alaska upwards, but it gained three states from the Lean McCain column -- Georgia, North Carolina, and South Dakota. This gives him a total of five Probable states with 49 electoral votes between them -- GA, MO, NC, SD, WV. Total Likely McCain: 21 states, 183 electoral votes. Still behind Obama, but catching up. In the Lean Obama column are three states, two of which moved down from Probable, but one of which (Colorado) moved up from Too Close To Call -- CO, NM, PA. I think after a few more polls that New Mexico and Pennsylvania will firm up for Obama, but I expect Colorado to be close all the way up to the election. 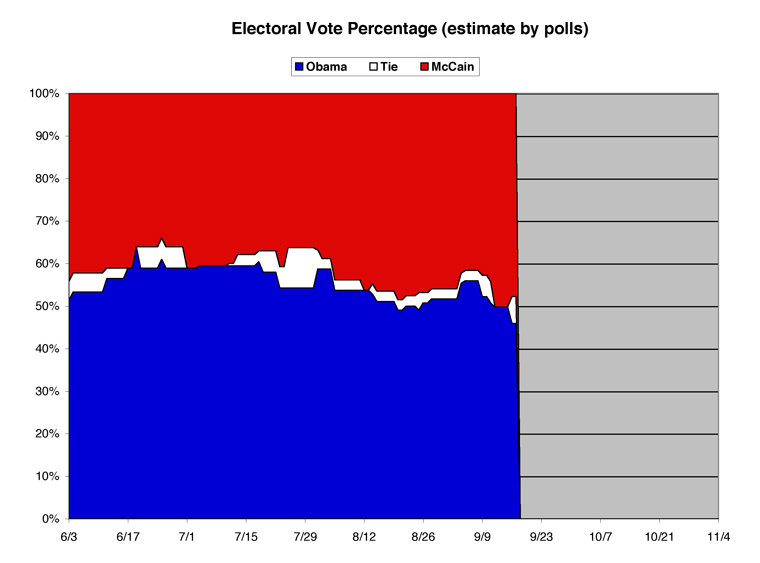 Total electoral votes in Lean Obama this week: 35. The Lean McCain column is nothing but good news for the McCain campaign. Three states (GA, NC, SD) moved up to Probable, and three others (FL, MT, ND) moved in to take their place from the Too Close To Call category, leaving McCain with a total of 33 electoral votes in this column. Which brings us to the Too Close To Call states. The number of these has shrunk, which is to be expected after both campaigns shored up their support during the conventions. This category may get a lot bigger before the election, though. Currently, I have only four states as complete tossups -- IN, NV, OH, VA. These total 49 electoral votes, and may go down to the wire and determine who our next president will be. That's it for this installment of poll watching. Sorry for the bad news, but hopefully the next time we take a look at the charts they'll be singing a happier tune for Obama. Previous electoral math columns: [6/30/08], [7/21/08], [8/6/08], and [8/20/08]. I remain convinced that all of this will change after the VP debate...call me a cockeyed optimist. We haven't even begun to fathom the unprecedented significance of the VP selections to the presidential election this year - not by a long shot! The entire article is a must read. In an Election Year where Dems should be wiping the floor with Republicans, there are actually CLOSE races all up and down the board. I live in a rural area of S.C, and this is my first year to vote for a Democrat, I went to the headquareters and signed up to bring folks to the polls to vote that did not have transportation, well, lo and behold, the heaquarters here can't pay the rent, yard signs are $10.00, buttons are $5.00. I was amazed how about you?? This rural county is Oconee we have Lake Keowee, and several Cliff resorts as well as Lake Jocassee. I do not understand the Democratic Party not helping "spread the word"
I've been a big supporter of Howard Dean's "50 state strategy" and am a little disappointed to hear your story. Now, SC is probably going for McCain, but the whole point of such efforts is to help down-ballot candidates in such states. So, like I said, I hope this is an isolated case and not reality in places across the country. OK, I gotta admit, that is pretty cool. Bridge-of-the-Enterprise cool!